After the Youngsters, the next evening was the "Sagai" ceremony. If you wish to know about the rituals from the ceremony you can check the link here. 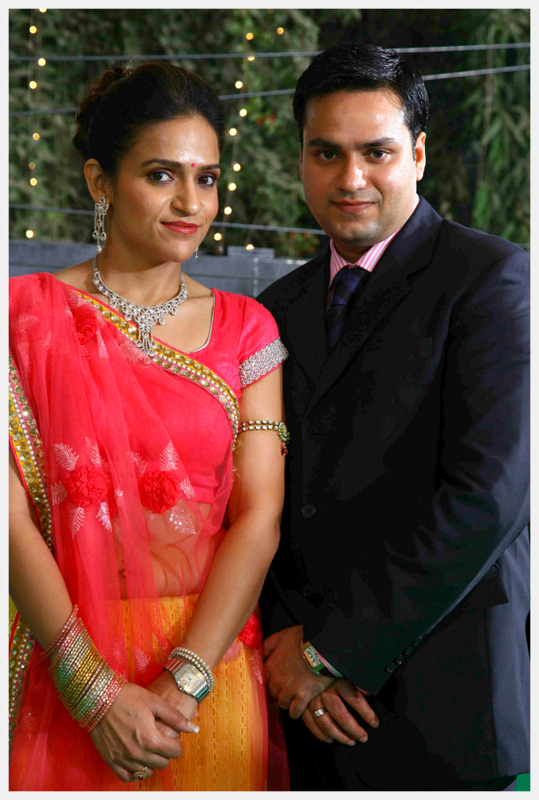 I was wearing a lehnga-style Saree with the front-pallu and had my hair in an updo. I had tried both these things for the first time. 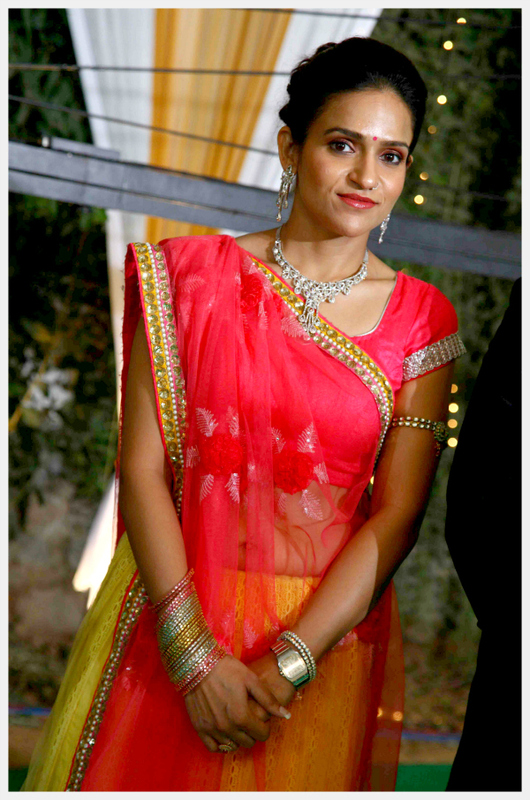 Usually I like to wear my Saree with the back-pallu and like to keep my hair down and simple. (If you have checked the posts from my own wedding, then you already know that!) But since this is the LAST wedding in my family, I thought if I don't experiment now, then when will I? P.S. If you are already following me on twitter then you might have already seen the back of the outfit. Unfortunately, this is the only full shot I have courtesy Anita! 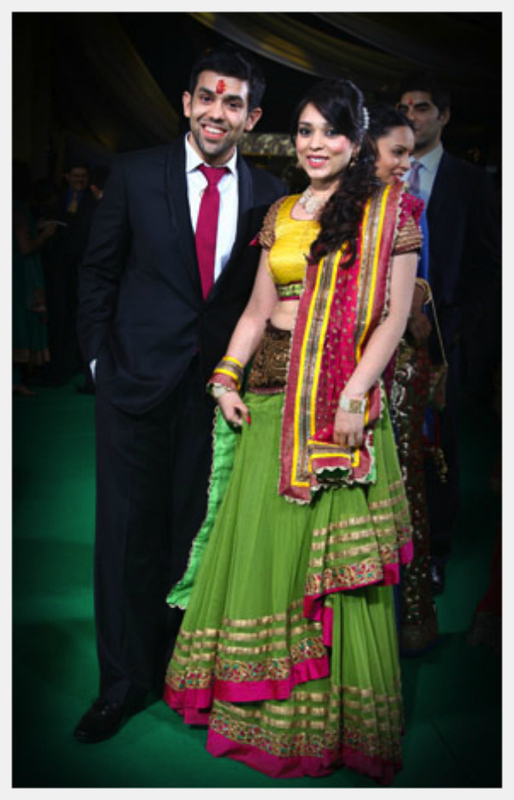 You look absolutely stunning, Tanvi! very coool looking. Love the bright colours! I love your hair up and the skirt is too fun! Tanvi, I find your lehenga style saree quite interesting and iunique, I have not seen anything like ths before-at first I thought that it is a lehenga - the colors are gorgeous ! You look great! I also love what your sister-in-law is wearing! u r looking gr8 in the bright colours tanvi..SILs outfit is gr8 too..they luk lovely!! Beautiful! Reminded me of your mum's pic in sari sitting down. I came across your blog via another blog. I was hooked just scrolling and reading your stories. I love all your fashion pairings. You do look fantastic. I really like what your sister-in-law is wearing. Love the shade of green! You look great. I love longhand sarees...the give you uch great shape! Tanvi you are absolutely stunning. I love that you share your culture with us on your blog. I love learning about it! Love the colors. And the updo shows off those beautiful earrings! ah..the men are looking handsome and the ladies are looking beautiful. I love your makeup here. you look so different with your hair up like this. i do like your Saree, and your sister-in-law looks gorgeous! that color looks amazing on u, and the jewelry ur wearin is adorable! You look incredible! Congratulations to them!! I also just checked out the photos from your wedding. So gorgeous. is there a reason the stomachs are always exposed? i have no issue with this; just wondering why. Gorgeous- you look stunning in Indian clothes. 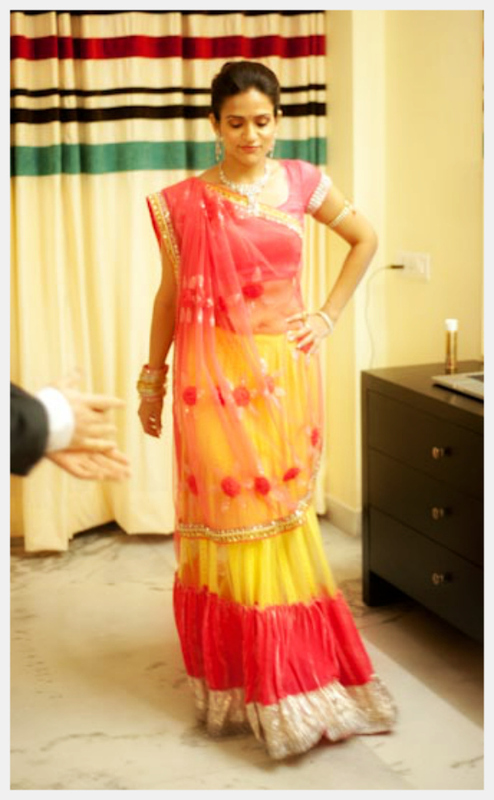 Love the bright colors :) tanvi you look so elegant with an up-do! Good looking couples you all are :) I need to try this color combo, very interesting. Well captured photographs for making memories fresh years later too. U look so so beautiful in this exotic colors, stunning!!!! You are looking absolutely stunning! And may I just say one bollywood dialogue, here? Lovely photos! And pretty lehnga! Just saw this!!! You look amazing!! Love that smile! Love your dress and your sister-in-law's gress. STUNNING! i think you wear an updo beautifully. it suits the shape of your face AND you look fab in sarees period. even if you wear them inside out:-). love the vibrancy in the colours! Wow you look gorgeous! What an amazing ritual! This is the first I've heard of "Sagai". liking all the happy colors!! Happy ppl wear happy colors:)!!!! Waiting for the videos now.